I have been hiking and running around an abandoned 16 acre field near my home for the last year for exercise, and this spring I started paying attention to some familiar spouts popping up – raspberry and blackberry canes. That got me thinking about how much my family likes fresh berries, and the high cost of them at the store, so I decided to go berry picking this year. Wild Berries are great for preppers, homesteaders, bushcrafters, and fans of self-sufficiency because they are low/no maintenance plants that propagate themselves. In addition, these berries are full of vitamin C, and can be stored in several ways for use in normal times, or for when SHTF. 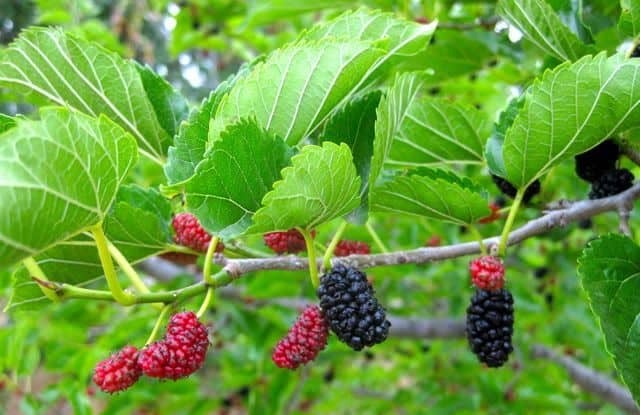 Blackberry leaves were chewed by Roman soldiers in ancient times for their vitamin C and tannin content, and today blackberry leaf tea is helpful in reducing the symptoms of diarrhea, a dangerous condition when medical help may not be available. I have also found a mulberry tree and elderberry bushes in public parks in my area, so I have been collecting their harvest as well. If the tree is in a public park, pick a time when few people are around. It’s probably legal to collect berries from it, but why take a chance, and why alert other people to free food? Dress in an old t-shirt and shorts, preferably dark or red-purple. Mulberries stain like crazy, so don’t go picking dressed in anything nice – boots included. Bring a 5-gallon pail, a 10’x10’ tarp or plastic sheeting, and a stick or scrap wood about 10’ long. Lay out the tarp or sheeting under the first large branch, and tap or strike the branch to make the berries fall. Have a friend help collect the tarp corners, and pour the berries into the pail. Move to the next branch, and repeat. When the tree has been thoroughly harvested of ripe berries, come back in a couple of days, and get a whole new harvest. They ripen over about 2 weeks, so you will be very busy if you want them all. Note: do not pick up berries off the ground, as deer love mulberries and will poop on them as they graze. Watch your step! When you get home, carefully wash and clean the berries, and keep cool until processed. Raspberries in my area near the woods, so I dress in an old t-shirt, jeans, boots, and a wide-brim hat. I apply bug spray to my pant cuffs, arms and neck to keep the ticks and chiggers off. Wash your hands after applying the spray, so the odor doesn’t get on the berries. Keep your eyes peeled for these black beauties on thin green canes– black raspberries are smaller than blackberries and may be hidden by the leaves. If raspberry canes have thorns, they are usually small enough I don’t worry about them. 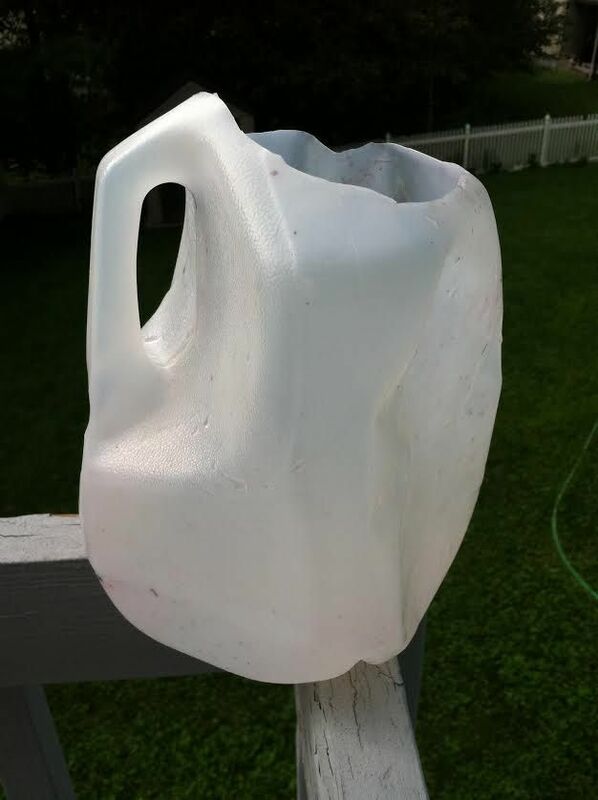 Collect in a modified 1-gallon milk jug or two, strapped through your belt. This method allows you to collect with two hands. You probably won’t collect many, due to their small size and lesser frequency, but they are worth it, as they are sweeter, and the smaller seeds are much easier on the teeth than blackberries. Blackberry canes are thicker, taller, and have sturdy thorns that tear the [email protected]#$ out of your clothes and skin. Prepare yourself the same as for raspberries, but if you can stand the heat, you may want to wear long sleeves to protect your forearms. I just grin and bear it in a t-shirt, and stay cooler. Try to pick strategically, standing in one spot, picking every black berry in reach 360-degree blackberry move to the next unpicked area. Yes, the thorns hurt, but you’ll get over that and I have yet to get an infection for a thorn scratch. With luck and enough canes, you should be able to pick about three quarts an hour during the peak picking days. I go back to the patch every two days to get the newly ripened berries. Elderberry bushes don’t have thorns, and for that I am grateful. The berries are cleaner to collect, as they tend not to burst when picked, which is another big benefit. The downside – unripe elderberries contain the mildly toxic sambunigrine, so only eat the really ripe ones. Elderberry flower tea is said to boost your immune system, and a daily tablespoon or two of elderberry syrup can shorten your flu or cold. Dried elderberry leaves can be used to keep mosquitoes away too. Select only elderberries that are dark purple/black. Place the head into a plastic bag for collection, then cut the stem that holds it to the bush. When done collecting the heads, take home and wash.
Use a fork to pull the berries off the head. Now that you have your berries, you need to decide what to do with them. I like to diversify my berries, so that I can enjoy them in a variety of ways and times: either fresh, frozen, baked, canned, or dried. Fresh – Fresh raspberries and real whipped cream are the best, while fresh blackberries tend to be too tart to enjoy. The mulberry flavor is OK, but its biggest benefits are volume and sweetness (now that I think about it, mulberries used for wine would be a pretty good use, but that’s for another post). Elderberries should be heat-processed in some way, for safety’s sake. Frozen – If you enjoy them fresh, but have too many, why not freeze them? I just place clean dry berries in a quart Tupperware container, and when thawed they are passable as fresh, but better is then baked or otherwise heat-processed. Baked – All of these berries are delicious in tarts, pies, and cobblers. I used a blackberry pie recipe last night, but make it into tarts. It’s cleaner to eat, and the kids loved it. Canned – The canning method is probably the favorite of preppers and homesteaders alike for the durability of the resulting food. It keeps for years, and the jelly/jam/preserves are full of sugar for preservation and calories when they are needed. 1) Mash the berries in a large saucepan. Add sugar and juice, place on medium heat. 2) Core apples, slice thinly. Tie up in a cheesecloth bag (or don’t – this adds more pectin), and place in same pan. 3) Bring to a boil, watching carefully so it doesn’t boil over (happens easily). 4) Cook for 15 minutes on low, then let cool while prepping and heating canning pot. 5) If you bagged the apples, remove the bag from the pot. If you didn’t, scoop the apple slices into a ricer, and rice the apple/raspberry glop back into the pot. Dispose of the solids caught in the ricer. 6) Fill the 6 to 8-pint jars with ½” headspace, close, and process for 15 minutes. Your jam will not jell at first, but within 2 or 3 days the pectin will do its thing, and it should be firm enough for toast, sandwiches, or whatever. Good for immune system reduces sick time. 1) Place the berries and water in a saucepan, bring to a boil, cook for 15 minutes. 2) Rice the berries with the “fine” plate to remove the numerous seeds, into another saucepan. Dispose of the seeds in the ricer. 3) Bring the elderberry juice back up to a boil, and add the sugar. Reduce to low heat. Prepare the canning pot. 4) When the syrup starts to thicken, turn off and fill the pint jars with 1/2 “ headspace, close, and process for 15 minutes. I have a second batch of blackberries in the dehydrator right now, as I write this. The first batch of 2 quarts fit onto 4 trays and took about 18 hours to dry. Now they are about 2/3 of a quart of crunchy tart nuggets, ready for snacking, pemmican, or rehydration with boiling water at some later date. You could also dry them by placing those 2 quarts on a lipped baking tray, and put it under a screen in the hot sun for a few days. You could also plant them, I guess, if you were starting a post-SHTF garden, or trade them with someone else who wanted to start a garden. Blackberries turn red as you dry them, so don’t be surprised. Berries are a perennial source of fruit that keeps giving all summer, so keep your eyes open when you walking around empty lots and parks in your neighborhood, and get picking! I read that you don’t need pectin to do Raspberry Jam they have it naturaly, I did not get many black berrys, due to not enough rain, but enough to make a couple of pies. I did get enough raspberries, to do jam I usually do a big batch now because I pick and freeze for several weeks. I need to plant my Elderberries, in the grown just in a big pot is not enough room for them to grow and produce. good yr for rasberries here! we have 4 gallon bags so far and will be able to pick until a hard frost! Previous story What is the Best Dog Breed for Homesteading?